This is exactly the sort of post that you are supposed to write at the beginning of Global Entrepreneurship week, rather than the end. The fact that I’m tapping away on a Friday, and not a Monday means a couple of things. First of all, that the week – which celebrates entrepreneurial activity across 104 countries – has been action-packed. Just yesterday I hosted not one but three Speednetworking sessions, for The Marketing Society, for BIS AND for EO, the Entrepreneurs Organisation. All over the world, over 40,000 events have been taking place, from London, to China, to Australia. World leaders have lined up to lend their support and here in the UK, Prime Minister David Cameron urged us Brits to “Make a job, and not just take a job”. The other benefit of penning something at the end of a week, is that you can come up with a couple of reflections. Here then, for what they are worth, are five themes which I would like to see discussed and acted on a bit more in the months ahead. 1) “We need to get the banks lending again”. This is the refrain I have heard at almost every event. It is also the one-liner used when discussing how to get more people starting up. “If only banks would lend to start-ups”. Why? Is this the role of the banks? Lending money to high risk ventures? What’s in it for them if the company does incredibly well? They get their money back and earn some interest. I think that we have got a bit confused about the role of banks. We need to explore other methods of getting cash into start ups, be that including angel funding or otherwise. 2) “If every small company in Britain employed just two people, we’d wipe out unemployment”. This is your Buzzword Bingo Phrase number two. The thing is, thousands of entrepreneurs are being encouraged (by their peers and advisors) to do the opposite. NOT to employ people. To outsource everything. I don’t have a strong view on which is the better option. I’d just like the changing shape of companies to be explored a little more. 3) We Brits need to get out more. For a Global Entrepreneurship Week, I’ve heard precious few international examples shared of what works. Maybe I’ve been tuning in to the wrong things. From time to time, someone will mention Silicon Valley or the American’s attitude to failure. That’s not enough. I want real examples from Singapore, from Sweden, from Germany, from Brazil. How do you choose which red tape to cut? How do you change enterprise culture? If we’re not careful, we’ll be an island nation in more ways than one. 4) “Government needs to get out of the way”. Congratulations! You have won the Buzzword Bingo Grand Prize. This is the phrase most often used at entrepreneurial events when discussing Government. The trouble is, it’s wrong. Of course, Government shouldn’t be IN the way – it’s just that the call to ‘get out of the way’ suggests that they have no role to play. This, I think, is nonsense. Aside from the obvious need for business to interact with the state to fulfil its legal duties, Government has an amazing potential to convene, to cross-pollinate ideas and to point people towards solutions on the ground. This might not involve ‘delivering’ stuff themselves, and may sometimes involve funding others to do things. To command them to leave the scene completely misses a big opportunity. 5) “Schools need to change”. Yes, this may be an overused phrase. But I’m not awarding it ‘Bingo’ status, because it is the one closest to my heart. As long as we keep treating children like buckets to be filled with facts, we’re going to have a problem. They need to learn by being active, not passive, and by engaging with people from outside the classroom. Passing on facts is one tiny piece of the puzzle. The job of school is to prepare young people for the world, to prepare them to change the world and to unleash their potential. Yes, that sounds corny, but it’s true. Yes, we need to evolve enterprise education. That’s just the beginning. We need to redesign school. Any takers? Two years ago I flew around the world, visiting 12 countries in under a month to promote Speednetwork the Globe. It was exhausting but amazing. As I rush to blow my final whistle of the week, at the GEW Wrap Party, I’m thinking about the hosts and participants in the other 103 countries, and hoping that we (the Brits) will cross paths with you more often in the years to come. 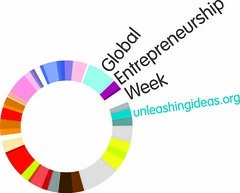 For now, Happy Global Entrepreneurship Week, and see you next year! It is good to hear an entrepreneur addressing the point that it is no good looking to banks to provide equity funance at debt funding prices. Banks get that there is a problem, but among entrepreneurs this issue seems to be becoming the default criticism of what is holdimg UK entrepreneurship back.